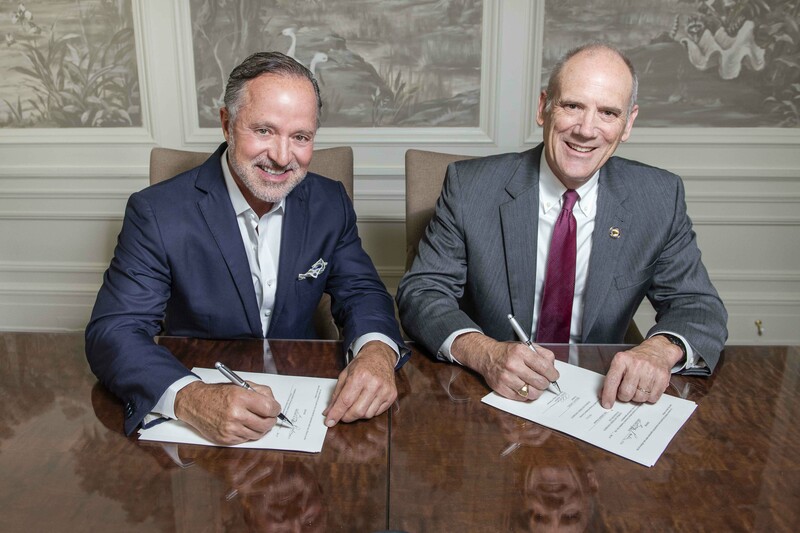 PHOTO CAPTION: Parker’s CEO Greg Parker, left, recently signed a landmark gift agreement with Georgia Southern University’s College of Business Dean Allen C. Amason, right, giving $5 million to name the Parker College of Business at Georgia Southern University. The largest single gift in the university’s history will fund student scholarships, support faculty research and create the new Parker Business Scholarship Program at Georgia Southern. The Parker Business Scholarship Program (PBSP) will provide personalized professional development and educational enrichment opportunities to a select group of students in the Parker College of Business. Implementation of the PBSP will begin in fall 2019 and include specialized coursework, unique professional development opportunities and other experiential learning activities. The Parker Companies, along with the dean of the College, will have direct involvement with the PBSP students. The Parker Business Scholarship Fund will enable recruitment and retention of greater numbers of the best and brightest students and will attract students with the potential for competitive offers from other universities, making the Parker College of Business a destination of first choice for students across the state and region. The Parker Faculty Support Fund will support faculty members and their research. Research is essential to the academic reputation of the College, to the scholarly currency and prestige of the faculty, and to the overall value proposition of the College as a leading academic institution.